CNETThe quest for self-driving cars puts deep neural networks on the fast track, a technology that teaches computers to accurately recognize objects from the real world. 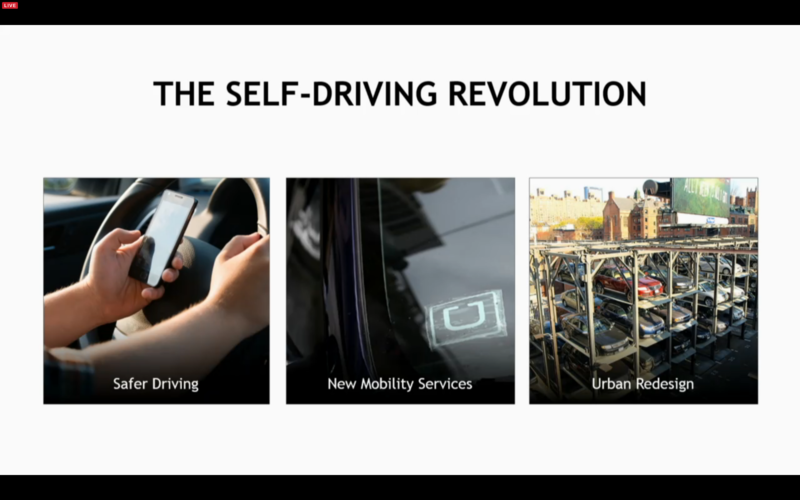 Jen-Hsun just announced Drive PX2, a new version of the self-driving car computer. Hello, and welcome to CNET's live blog of the Nvidia press conference at CES 2016. I'm Wayne Cunningham, editor for CNET Car Tech. As we wait for Nvidia CEO Jen-Hsun Huang to take the stage, we have Nvidia's signature green graphics spilling across a large screen at the back of the stage. Those graphics show roadways in a virtual city, which should give you a clue as to what Nvidia will be talking about here. 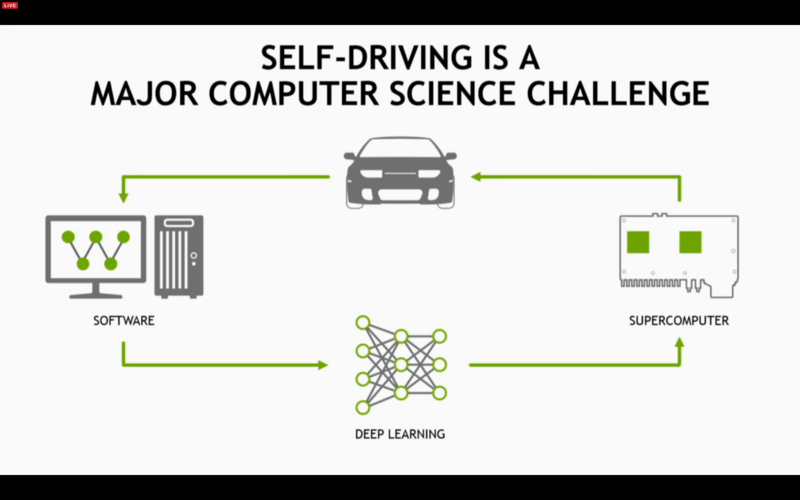 Yes, it's all autos all the time with Nvidia these days, as it turns graphic processing expertise to the problem of self-driving cars. In the lobby ahead of the conference, I saw Mathias Halliger, who develops high-tech infotainment solutions at Audi, and works closely with partner Nvidia. 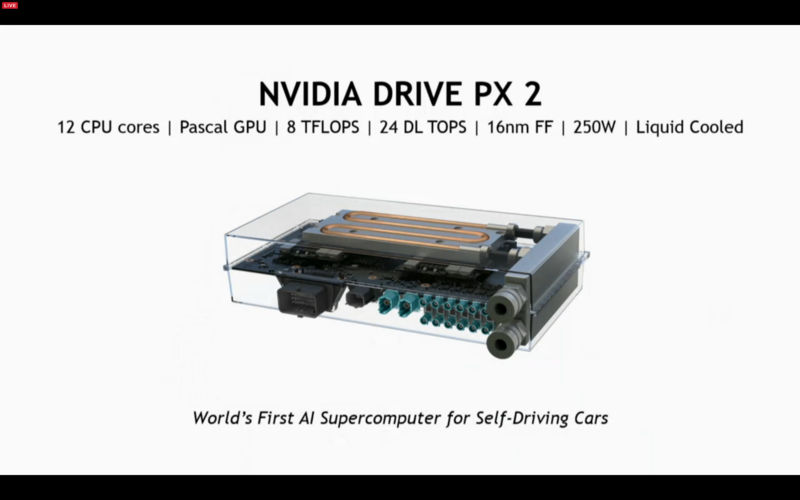 Last year, Nvidia introduced its Drive PX computer, a processor designed to enable self-driving cars. I'm expecting more about that at tonight's conference. Jen-Hsun himself is a big gearhead, and has some impressive cars. 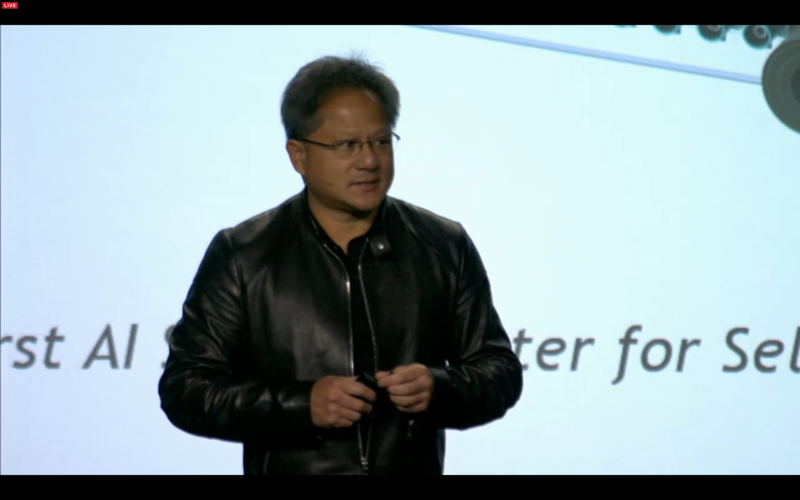 That passion has given life to Nvidia's automotive efforts. Jen-Hsun has just taken the stage, and he is talking about cars. 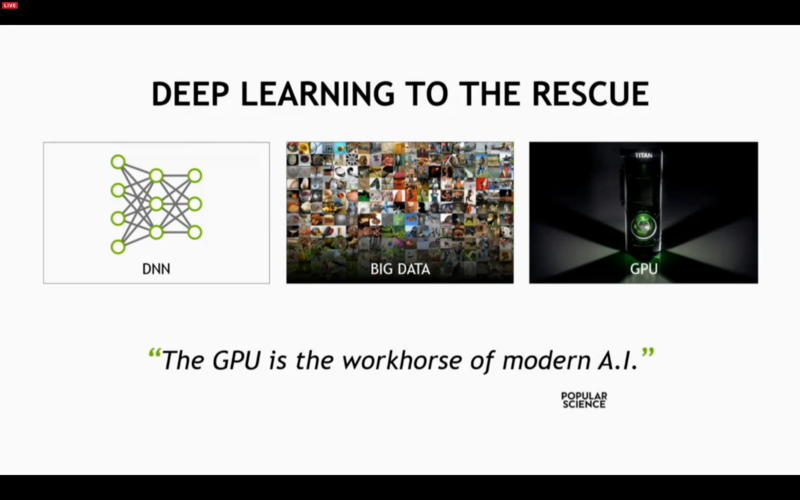 Background graphic shows software, hardware and deep learning, a fascinating topic in its own. 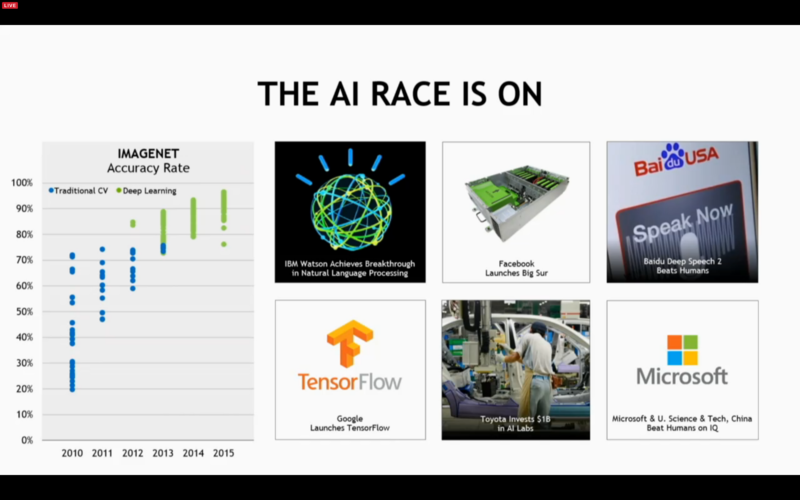 Jen-Hsun is recapping some of the stuff he talked about last year regarding deep learning and self-driving cars. 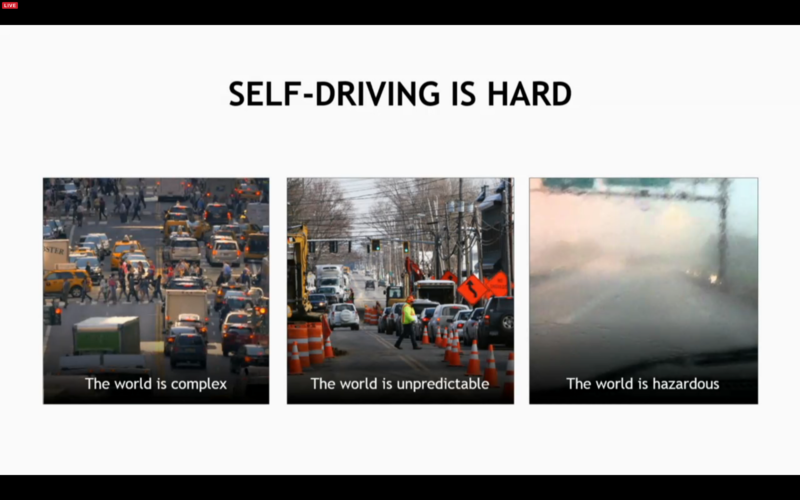 "Transportation mobility is the most important thing to society"
"The human is the most unreliable part of the car"
Jen-Hsun is citing the reasons for self-driving cars. Maybe fewer cars on the road, as fewer people would need or want to own one, if self-driving cars could be summoned on a service basis. Two visions for self-driving cars today: Toyota's idea is having a virtual co-pilot, making cars safer. 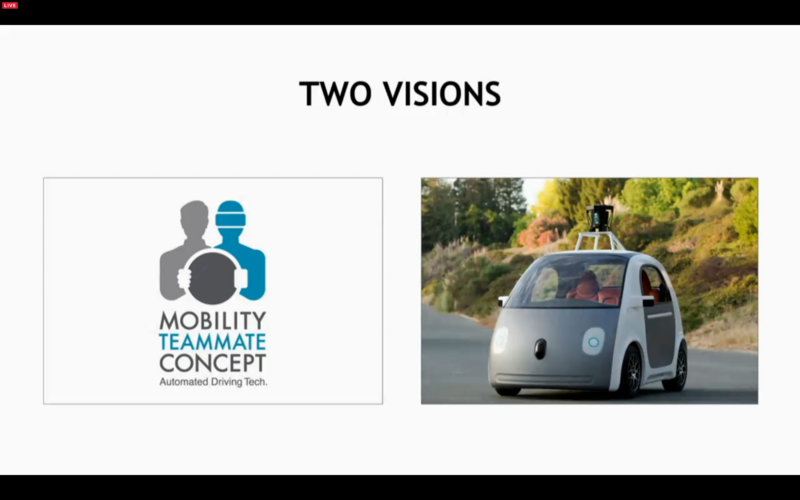 Google is more about robo-taxis, as I read ahead of Jen-Hsun's slide. 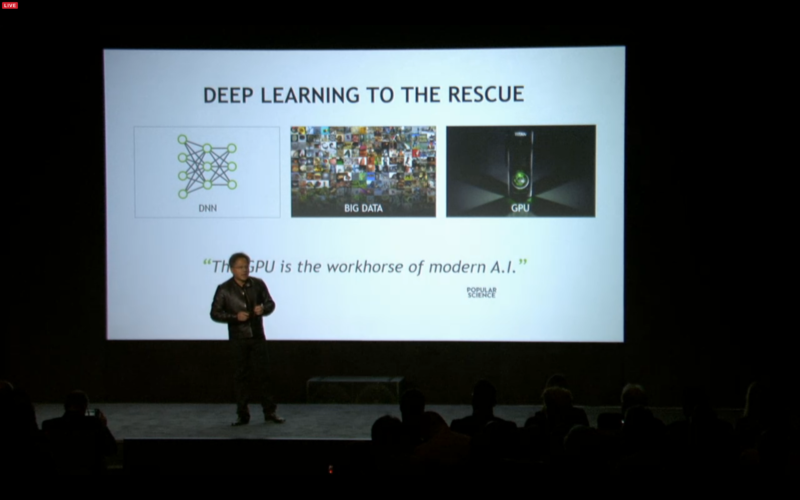 Either vision will be a contribution to society, and Jen-Hsun says Nvidia is all about enabling it. 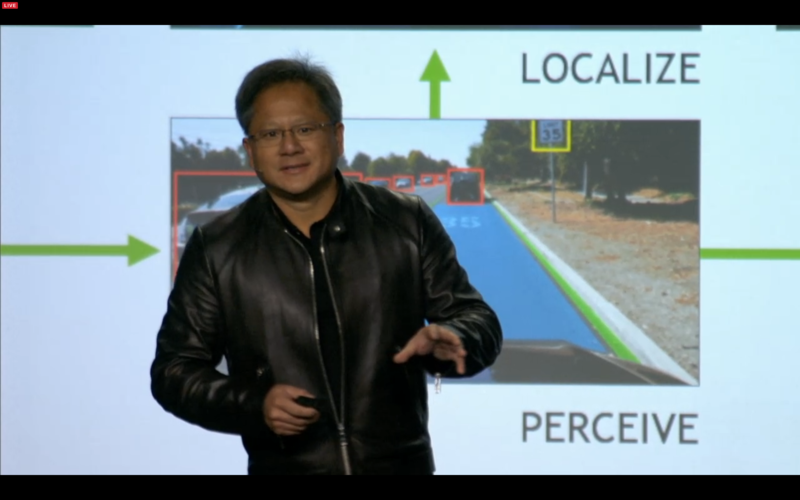 The three stacked blocks signify mapping and sensors, Nvidia's schematic, in broad terms, for self-driving cars. 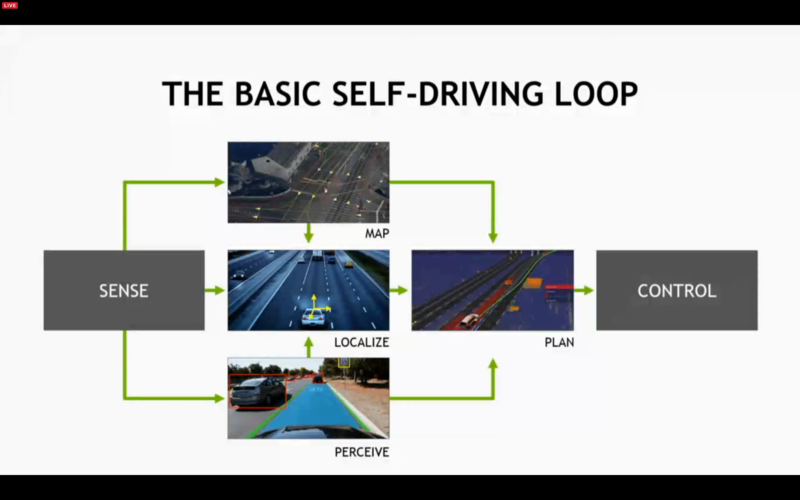 The "loop" part of that is important, as the car needs to go through sensing and path-planning continually. "All of these components are hard to do"
"Highway driving is relatively easy"
Although now Jen-Hsun points out some of the things that complicate highway driving. "City driving is very chaotic, very hard"
It is very cool stuff, showing a computer many images and what is in the image, then letting the computer analyze each image for commonalities. After, the computer should be able to identify objects in completely new imagery. Going into the history of Deep Learning, talking about Alexnet, a deep learning network for visual objects. More innovations in Deep Learning, pointing out how these systems are beating humans in language recognition and IQ. Scary. 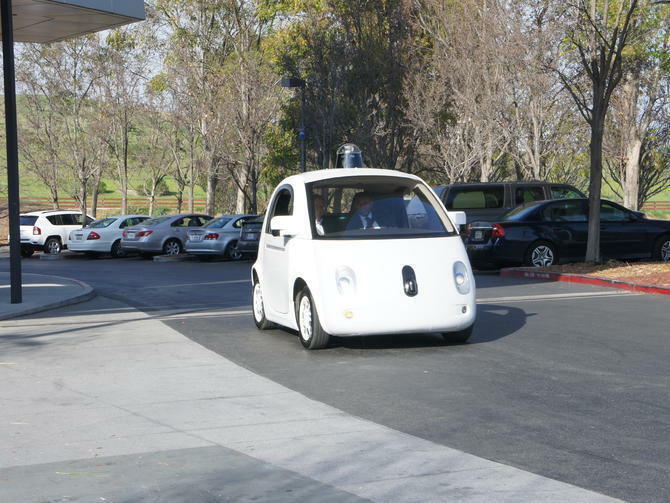 Now, how to use Deep Learning for self-driving cars.